Recall our recent post, Why a Saviour Had to Suffer and Die? Martyrdom Beliefs in Pre-Christian Times. I have just come across a similar list making the same point: the blood of Jewish martyrs was believed to purify and cleanse the nation; the martyrs’ blood led to God’s forgiveness of the sins of the nation and the salvation of all. Third, the martyrs suffered and died because of the nation’s sin (2 Macc 7:18, 32; 12:39–42; 4 Macc 4:21; 17:21–22), just as the high priest offered the animal’s blood for sin on Yom Kippur (Lev 1:1–7:6; 8:18–21; 16:3–24). Fourth, the martyrs’ blood was the required price for the nation’s national purification, forgiveness, and salvation (2 Macc 7:32–38; 4 Macc 6:28–29; 7:8; 17:21–22), just as the animals’ blood was the required price for Israel’s forgiveness on Yom Kippur (Lev 16:30). Fifth, the martyrs’ deaths provided purification and cleansing for the nation (4 Macc 6:28–29; 17:22), just as the animals’ blood provided purification and cleansing for Israel on Yom Kippur (Lev 16:16, 30). Sixth, the martyrs’ deaths ended God’s wrath against the nation (1 Macc 1:1–64; 2 Macc 7:32–38; 8:5; 4 Macc 17:21–22), just as the animals’ blood when appropriately offered at Yom Kippur placated God’s wrath against the nation (Lev 9:1–16:30). Seventh, the martyrs died as representatives of and vicariously for the nation (2 Macc 7:18, 32; 4 Macc 4:21; 17:21–22), just as the animals were representatives of and were substitutes for the sins of the nation on Yom Kippur (Lev 16:1–30). Eighth, God judged sin and granted forgiveness through the martyrs’ deaths in the narratives (2 Macc 6:12–7:38; 4 Macc 17:21–22), just as YHWH judged sin and granted forgiveness through the animals’ deaths on Yom Kippur (Lev 16:1–30). 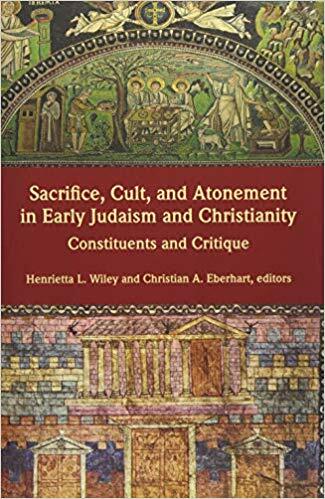 Wiley, Henrietta L.. Sacrifice, Cult, and Atonement in Early Judaism and Christianity: Constituents and Critique (Resources for Biblical Study Book 85) (Page 263). SBL Press. Kindle Edition. It would seem to be the most natural thing in the world for the Judeans who could interpret their martyrs deaths in such a way to imagine a similar fate, at least equally beneficial, for a messiah. This, especially if any thought of earthly military victory was utterly out of the question. Wiley, Henrietta L., and Christian A. Eberhart. 2017. 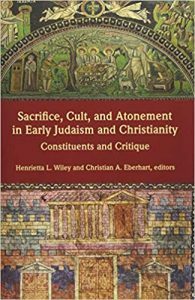 Sacrifice, Cult, and Atonement in Early Judaism and Christianity: Constituents and Critique. Atlanta, GA: SBL Press. Posted on 2019-01-15 21:29:25 GMT+0000 by Neil Godfrey. This entry was posted in Martyrs and martyrdom and tagged Christian Origins, Martyrdom, Messiahs. Bookmark the permalink. Yahweh has always been a death god. Why do you say that date is “wishful thinking”? Have you read scholars’ explanations for the supposed dates of 2 Maccabees? It’s standard Christian apologetics dating methods: the text is vivid therefore it’s based on eyewitness testimony. These details supposedly “evince a knowledge of the age which is hardly likely to have produced by a Jewish writer after the second century BCE,” whose “vivid touches … and independent notices which point upon the whole to the information of eyewitness and contemporaries behind some of Jason’s narratives” (James Moffatt D.D., The Apocrypha of the Old Testament, Oxford 1913, pg. 128).